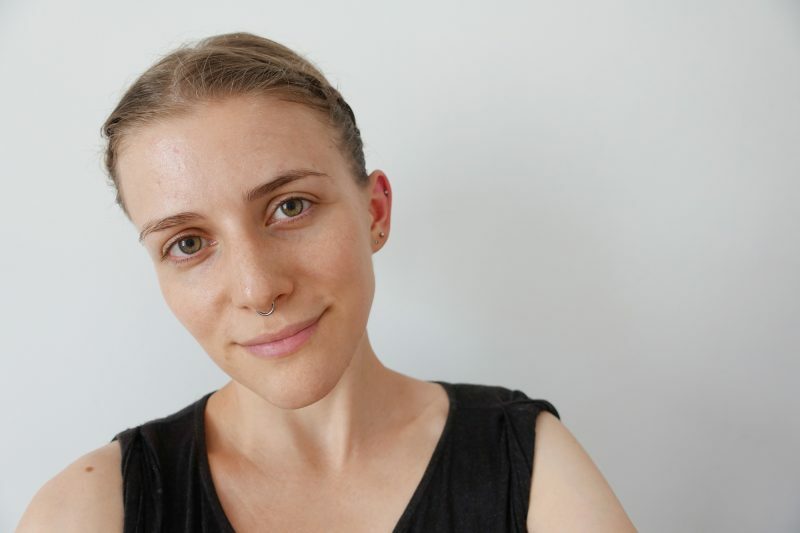 We both prefer to cook meals at home and are, therefore, not seeking out a ton of restaurants, which makes being vegan super easy. I usually carry fruit with me wherever I go and also love making my own veggie sandwiches. That being said, I do love patronizing restaurants and take immense pleasure in seeking places that offer vegan food. 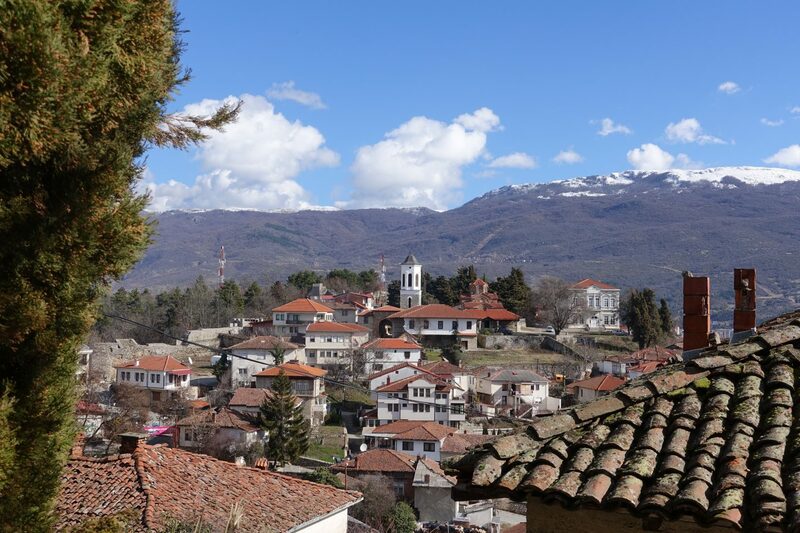 During this trip, I fell in love with ajvar, a spread made out of roasted peppers and other vegetables, and pita, a filled pastry made out of thin flaky dough which you can find throughout the Balkans. 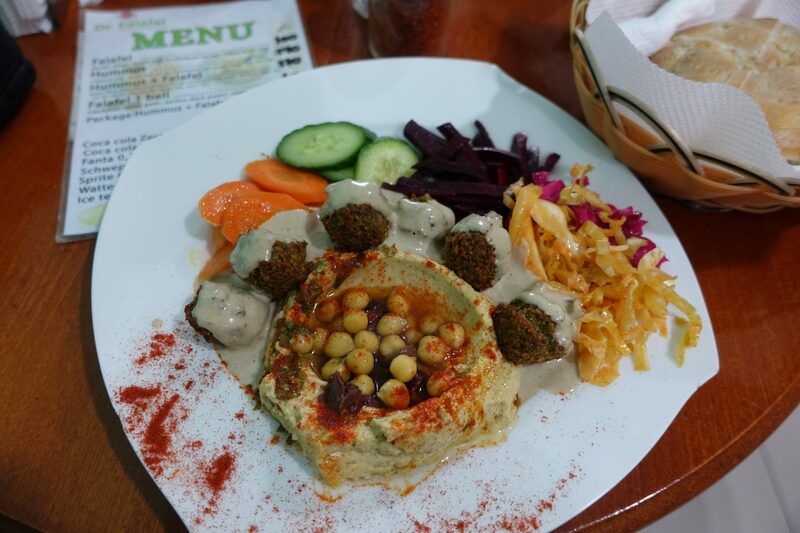 This is my guide to eating vegan in Ohrid and Skopje, Macedonia. Ajvar is a delicious spread made out of roasted peppers and various other vegetables. I pair it with literally anything – so far I’ve had it on bread, with home-made potato fries, and with barley. There are heaps of different brands out there and my favorite ones are usually the ones that contain pepperoni. Pepperoni really is the secret ingredient that’s giving it a little kick! The supermarket aisles are full of Ajvar and I highly recommend tasting a bunch to find your favorite one! 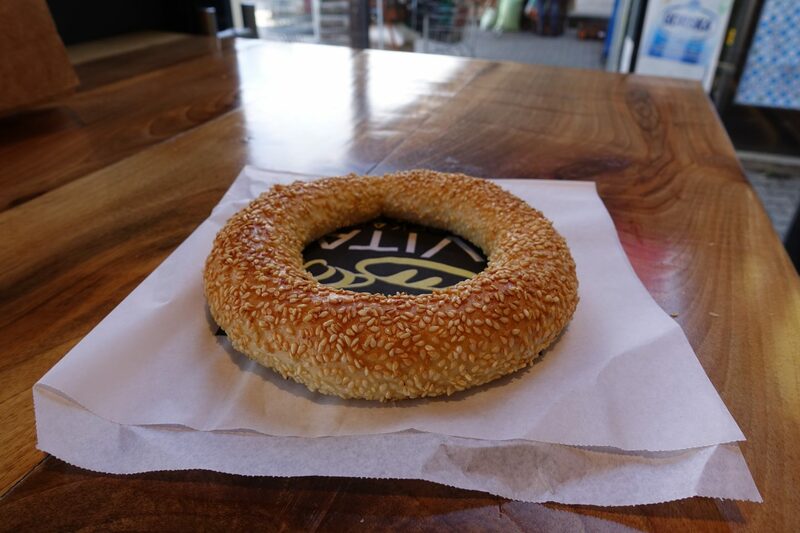 Gevrek is a circular white bread ring covered in sesame seeds. It can be found at most bakeries and is usually about 15 MKD. When I first stumbled upon it I didn’t think of it as too exciting until I went ahead and got one. It’s incredibly delicious, crispy and perfect with Ajvar! 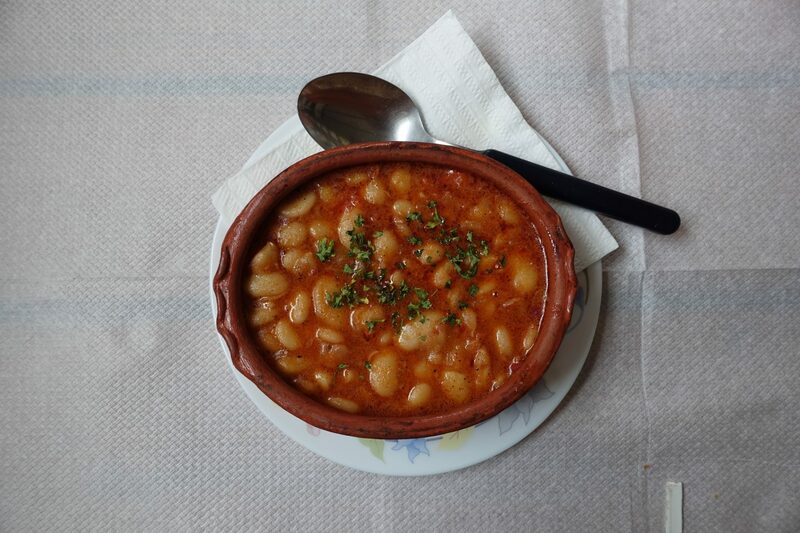 Tavche Grache is a traditional Macedonian dish that is, in most cases, vegan. It’s a bean stew with paprika, onion, and spices. A local informed me that the dish can sometimes contain sausage and I’d always double-check to make sure that what you think is vegan, is indeed so. When walking around Ohrid I saw that most places were offering it and it is, therefore, a neat option if you want to try a local dish. 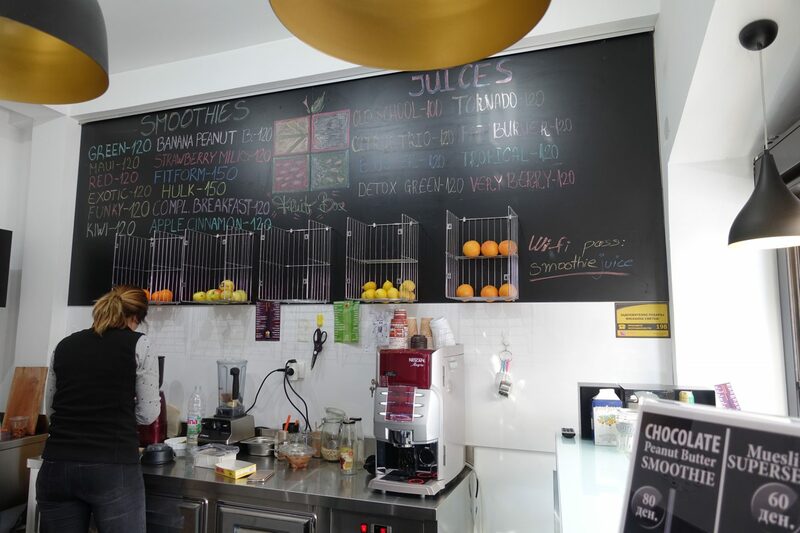 FRUIT BOX is a juice and smoothie bar offering vegan snacks, raw cakes, coffee and cereal with fruit. 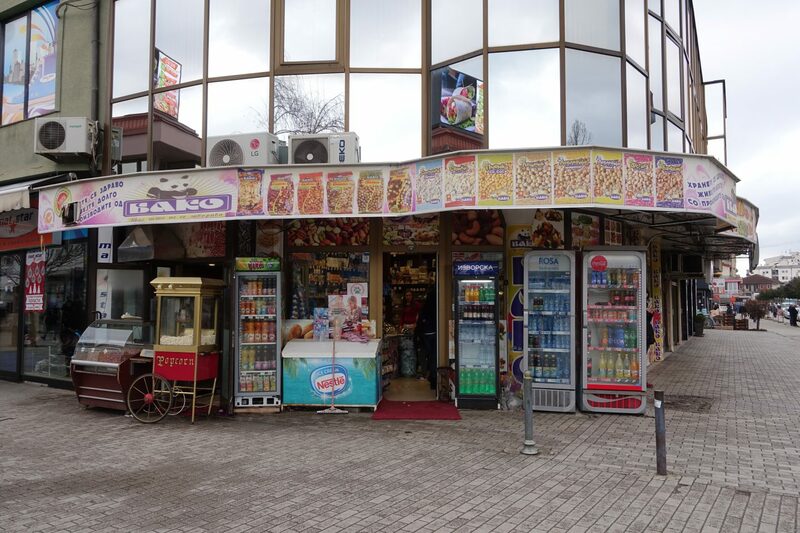 FRUIT BOX has two shops in Ohrid – the first one is located in the center of the bazaar and the second one is located on Boulevard Turisticka 1/7. FRUIT BOX has deals on a regular basis that are being advertised on their facebook page so make sure to check that one out before you go. I ended up getting the chocolate peanut butter smoothie with blueberry and peanut butter energy balls. Both the smoothie and the energy balls were incredible! Seriously, their smoothie was one of the best ones I ever had in my life! My babe and I are traveling on around $30 per day so whenever we do go out to eat we opt for healthy and affordable vegan food. This place has incredible reviews on TripAdvisor and the minute I saw photos of their food I knew that I just had to check it out. My babe got the falafel sandwich and said that it’s one of the best falafels he ever had. I have to agree – it was super tasty and incredibly filling! BAKO is a store at Boulevard Turistichka 77-A and offers a wide range of nuts, legumes, seeds, sweets, juices and heaps more. The majority of what they offer, they offer in bulk and you then simply pay per kilo. Another place, that’s really close to BAKO, on the same street, is Bio Cosmos. They have a great selection of packaged organic goods and offer some of them in bulk. I tried their cocoa chia seed cookie and it was absolutely divine! Seriously, the best chocolate cookie I ever had. Vega is amazing! Vega serves smoothies, fresh pressed juices, raw vegan desserts and smoothie bowls among other foods. Their smoothie menu is huge and they have an amazing selection of raw balls, cakes, and bars! The minute I read about this place I couldn’t wait to check it out. I tried several smoothies and all of them were amazing! Prices are around 120 MKD for most smoothies and 50 for most desserts. This post wouldn’t be complete without mentioning the greenmarket in the heart of the Old Bazaar in Skopje. 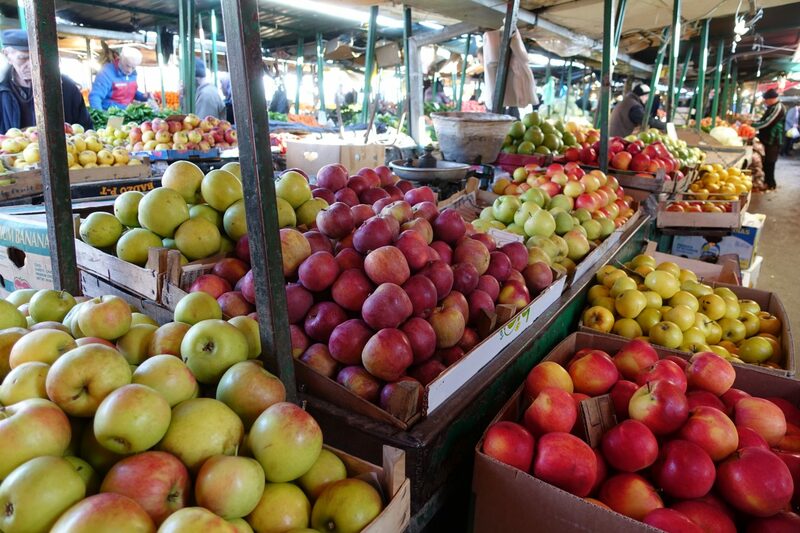 The market, also commonly referred to as Bit Pazar, is the biggest market for fruit and vegetables in the city. We ended up buying 1kg of spinach for 40 MKD, 2kg of bananas for 100 MKD, a bundle of spring onions for 10 MKD and other bits and bobs. I greatly enjoyed shopping there and highly recommend it if you are looking for fresh produce. I passed by Freshys when exploring the city and was intrigued by their menu and mission. Freshys donates 34% of their profits, they donate food to the homeless on a regular basis and they offer discounts to students and single parents. 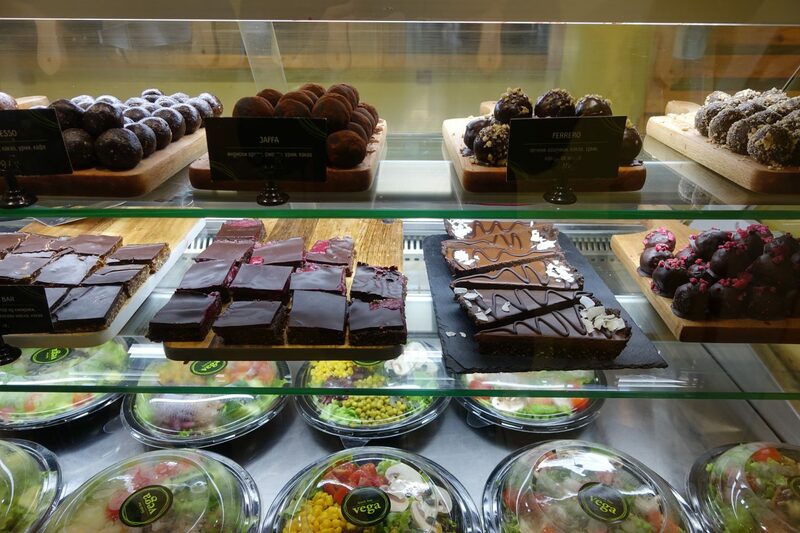 They offer puddings, salad, sandwiches, smoothies, juices and fruit salads. 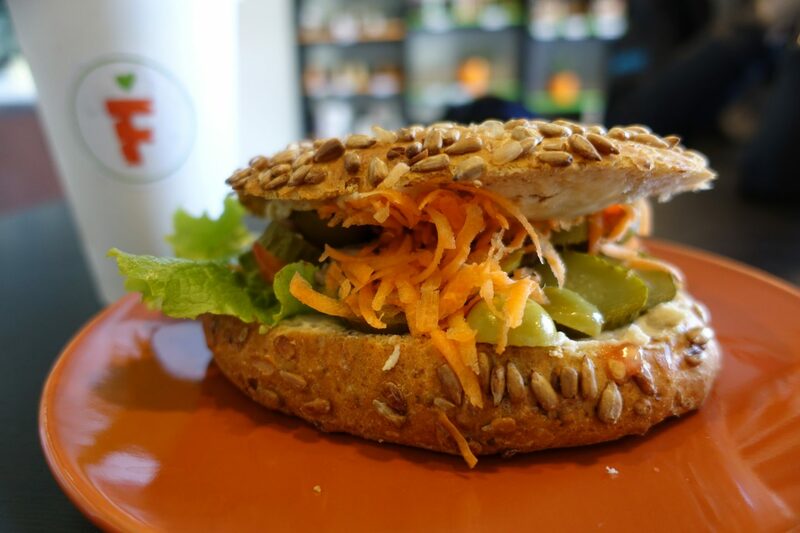 While Freshys isn’t a vegan place – they have a handful of delicious vegan options. 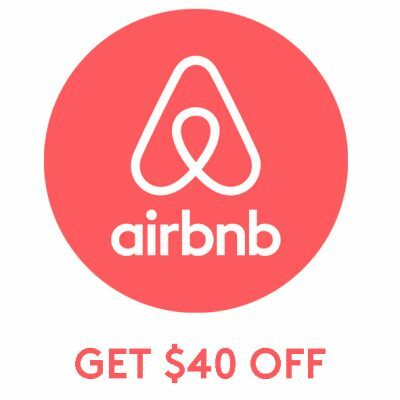 I high recommend their “red smoothie” and “hummus sandwich”. I feel you on that one! 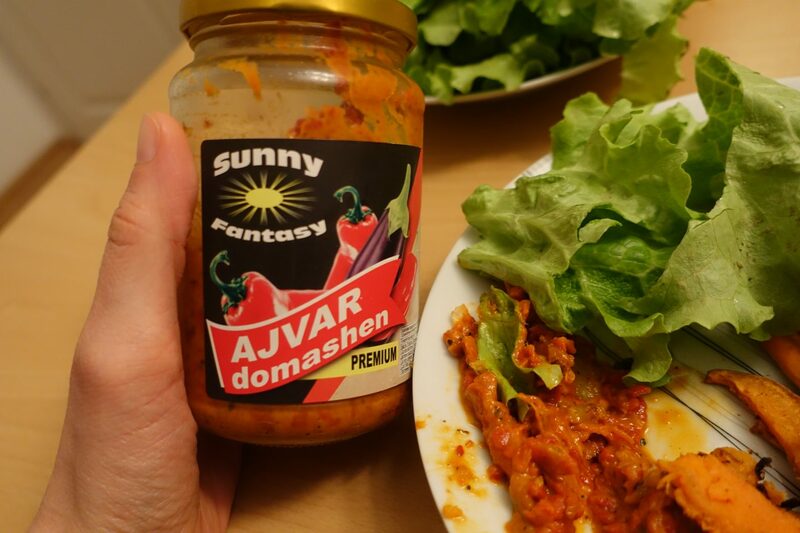 Ajvar is soo good! Oh yes, with all that meat, you need to take a break every once in a while. I ate heaps of meat back in the day over the summer, all those BBQs, and after a couple of weeks, I always needed to rest and cut down on meat. Totally understandable, it’s just too heavy! Dr. Falafel has a truly fantastic thing going, it was one of the best falafels I’ve ever had!